Discussion in 'Online Casino Promotions' started by Marina, May 8, 2014. The long awaited 234 Ways Online Slot Football Star from Microgaming is now live Guts Casino. And you can claim a 100% match bonus up to €50 to try your luck on the new game. Just make a deposit and use code FSMAY8. The code is valid until May 11th 2014 23:59 CET. But that is not all, you have a chance to win a trip for 2 tickets to the World Cup Final in Rio de Janeiro on July 13th 2014. 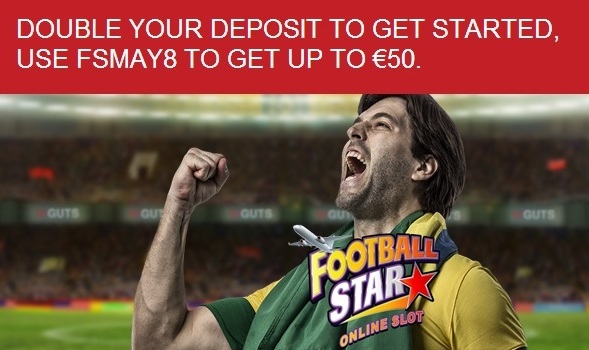 Every €25 you wager from now until June 8th 2014 on Football Star Online Slot gets you one entry into the draw. Terms and Conditions from GUTS apply.